In Southern California, the housing boom generated a seemingly endless repetition of pastel stucco boxes. This micro-portrait draws attention to the human side of this standardized environment, revealing the intimacy of anonymity in one suburban fortress. Vera Brunner-Sung is a Los Angeles-based non-fiction filmmaker interested in the way personal and social history is channeled through landscape and the built environment. In addition to making moving image work, she is an educator and writes criticism about film and art. ATA: Is Perlman Place a real place, and if so, can you tell us where it is? VBS: Perlman Place is the name of the street that I lived on when I first moved to California. 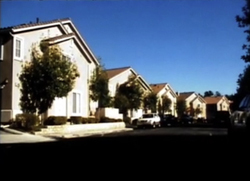 It's located in Stevenson Ranch, a private development constructed in the 1990s and today incorporated into the City of Santa Clarita. Many of the streets in Stevenson Ranch are named after famous writers, but in my little subsection, called "The Palisades," they were named after a mishmash of famous musicians and composers (Schubert, Wagner, Holiday, Armstrong). So Perlman, as I understand it, refers to Itzhak, the violinist. I think it's so interesting how master planners decide on systems for generating street names, since they are creating dozens of streets that must be named all at once. That in this case they chose names of individuals who have nothing whatsoever to do with the site, or Southern California in general, is just one indication of how dislocating the experience of living there can be. ATA: Who is speaking over the images, and is the performance scripted at all? VBS: The voiceover is spoken by my friend and housemate at the time. She had been telling me about all the things she'd been overhearing from her bedroom, so I asked her to sit down with me and let me record her. There was no script, just conversation. ATA: Some of your work seems to explore the relationship between private and public expression in suburbia. Can you tell us a little bit about what drives that? VBS: I'm interested in our experience of the built environment, and how we find meaning in and connection to the places we inhabit. In UNTITLED (PERLMAN PL.) I wanted to look at how people can connect in spite of their built environment; other than a distant pool, there are no gathering places in The Palisades, and even front yard patios come with four or five foot high stuccoed walls. In the end it was too isolating for me, and I moved to Los Angeles.